What Can I Do About Neck Wattle? A couple of friends and I were sitting in the kitchen sharing some health tips over luscious cups of steaming tea. We were talking about serious health issues here – perimenopause and hormone-related concerns. Then one of them leaned toward me and patted herself under the chin. 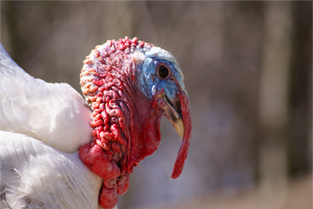 “You mean neck wattle?” It gets its moniker from the resemblance to turkey and chicken necks. I guess almost no one is totally immune to the sagging-neck thing. Maybe Jane Seymour and Sigourney Weaver. 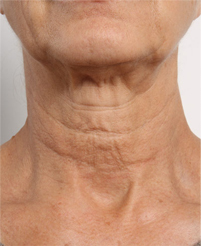 According to dermatologists, the neck starts to go around age 43. I must have been lucky, because I seriously didn’t notice anything until my 60s. Why is the neck area so susceptible? Among the factors involved are genetics, excess fat, weight loss, weakened muscles, thin skin, and sun damage. Ouch. Note to self: Begin staring lovingly at my neck every day. You should know right now that I’m not one to tout medical procedures. Botox and knives are not for me. I’m all about prevention and supporting the natural healthy aging process with good lifestyle habits. Anyway, moved to gather some helpful tips to stall the inevitable wattle, I asked my esthetician for her best advice. My esthetician is great – always wears a white coat just like a doctor and was a chemistry major before becoming a skin-person. She knows her stuff. Right off the top of her head, without hesitating a second, she rattled off: Vitamin C serums (she likes Cellex-C neck cream and Skinceuticals) and ultrasound treatments, which purportedly boost the collagen factor. You might not be able to avoid the dreaded wattle entirely, but rather than spending time in regret and wishful thinking, you’ll enjoy your ageless beauty knowing you do what you can to look and feel your best every day. Leave your thoughts below if you have something to share about neck wattle! Previous PostThe Lucky Ones Next PostCan You Be A Health-Conscious Foodie?